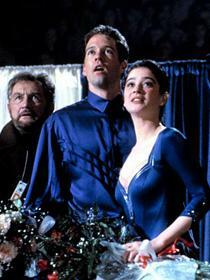 Overview - Moira Kelly (Dangerous Beauty, "The West Wing") and D. B. Sweeney (Roommates, Memphis Belle) star as polar opposites who unite on the ice for a shot at Olympic gold in this inspirational romantic comedy from acclaimed director Paul M. Glaser (The Running Man). Brimming with wit, charm and plenty of breathtaking sports action, The Cutting Edge is a real winner! She's a rich and refined pairs figure skater whose prima donna attitude has her skating solo. He's a brash, blue-collar hockey champion with a new injury and no future. With nothing in common but their dream of reaching the Olympics, Kate and Doug are each other's last resort. Reluctantly, they join forces, but its not long before the barbs - and sparks - start flying as the unlikely pair skate towards the opportunity of a lifetime: a chance at a medal...and a chance at love. Presented in 1080p Hi-def on Blu-ray for the first time! Do you like your romantic comedies to be about two hilariously mismatched total opposites who eventually fall in love? Do you like to watch male leads slowly overcome their womanizing ways in favor of meaningful, monogamous relationships? Do you like seeing emotionally distant, stuffy female stars gradually warm their frozen hearts? Do you like when constant misunderstandings arise between the two destined lovers, prolonging their eventual coupling? Do you enjoy frequent montages that show the bickering twosomes slowly bond while set to totally dated music? And, here's the real clincher, do you like when all of these dizzying features come together in entertaining harmony, while on ice? Well, if you answered yes to all of these questions (and really, who wouldn't?) then 'The Cutting Edge' is the film for you! Directed by Paul M. Glaser (yes, that's the guy who played Starsky on the original 'Starsky and Hutch') and written by Tony Gilroy (yes, that's the guy who wrote these and even directed this), this ice-skating fueled romance is typical rom-com fluff, but, despite my fairly sarcastic opening comments, I assure you I am not about to mercilessly ridicule this light cinematic effort. Sure, there might be some snarky undertones throughout the rest of this review, but the truth is, 'The Cutting Edge' doesn't really deserve to be mocked. A pure product of its time, the movie is a harmless, uplifting little date flick, that actually features a few interesting cinematic techniques. Seriously, it turns out Starsky knows a thing or two about camera work. When he suffers a career ending injury, hockey player Doug Dorsey (D.B. Sweeney) becomes desperate for any excuse to get back on the ice. As fate would have it, a stuck-up and difficult to work with figure skater, Kate Moseley (Moira Kelly), is in the market for a new partner, and through the magic of rom-com cinema, this unlikely pair comes together in a rather unrealistic but entertaining premise, that sees a former hockey player train for figure skating gold. Along the way, the bickering duo develop true feelings for one another, but a variety of factors, including a lame boyfriend, a rival skating team (the male skater's weapon of choice is a menacing wink) and the sheer pressures of the sport, fight to keep them apart. Despite the conflicts and obstacles, in the end… well, you know what happens. The script from Tony Gilroy (that still baffles me) is pretty standard and formulaic, but the screenwriter does inject a nice sense of humor into the proceedings. While there are no real surprises or detours from the traditional Hollywood path, the characters themselves are nicely realized. Sure, in many ways they are simply clichéd archetypes, but there is something appealing about the way they are written by Gilroy and played by the actors. Sweeney and Kelly share great chemistry, and watching them go through the motions of early quarreling to eventual passion can be entertaining. The slow melting of Kate's heart and the emergence of her playful, flirtatious side plays well, and though the whole will-they-won't-they angle is predictable, it's all much too sweet and sincere to truly hate on. There are numerous cheesy lines throughout, but the silliness somehow works and further endears us to the whole affair, and shuffled in among the lame one-liners, are some actual comedic gems, including one bar patron's humorous reaction to hearing the news that Doug has turned to figure skating. I must say, I was actually a little surprised by the heavy use of stylized filmmaking techniques. The general relationship scenes use a mostly functional, standard approach, but the sequences in the rink itself feature some interesting visual touches. Glaser plays around with shutter speed and frame rate, to create stuttering, slow motion shots, emphasizing the movements on ice. Lots of quick cutting close-ups of skates, body parts, and expressions create an exciting momentum in these scenes. Of course, no early 90s sports romance could be complete without some montage sequences, and 'The Cutting Edge' surely doesn't disappoint, offering some wonderfully cheesy scenes showing our lovers train with determination and flair, all while set to truly awful music. If that's not cinematic perfection, than I don't know what is. 'The Cutting Edge' isn't a great movie. Really, it might not even be a good movie, but it is a fairly entertaining and harmless relic of early 90s sensibilities. In many ways, though dated, the earnest sincerity of its themes and characters beats most of the industry's contemporary romantic comedy efforts. Films like this may not often be celebrated, but really, we need movies of this type every now and then, and while it's certainly not geared to my own personal tastes, it has its fans and its purpose. I guess what I'm really trying to say is, though I could surely live in a world without 'The Cutting Edge,' I certainly don't want to, and I don't think you do either. 'The Cutting Edge' is brought to Blu-ray by MGM on a BD-50 disc that comes housed in a standard case. The packaging indicates that the release is region A compatible. The movie is provided with a 1080p/AVC MPEG-4 transfer in the 1.85:1 aspect ratio. The image has a very natural, filmic appearance, that while never impressive, presents the picture in a respectful manner. The source print is in good shape, with only very minor speckles visible here and there. Detail is good, but the movie's photography is fairly soft and flat in appearance, rarely displaying any sense of depth or dimension. Colors are nice and pleasing without being over-saturated or unnatural. Black levels are very solid and whites are good but a little subdued, seldom giving the picture the kind of pop that other releases have. From a technical standpoint the video is everything it should be, and appears to be a straight, no fuss, respectful transfer free of unnecessary digital manipulation. With that said, despite some interesting cinematic techniques, 'The Cutting Edge' just isn't a terribly impressive looking film. The film is presented in an English DTS-HD Master Audio 2.0 track along with Spanish and French Dolby Surround tracks. Optional English SDH, Spanish, and French subtitles are included. Though there are a few dynamic moments, this is a very basic mix. Dialogue is crisp and full and there are no crackles or hisses in the track. Directionality between the left and right channels is present, but never really adds an impressive sense of scope. Dynamic range is mostly flat and bass is fairly nonexistent, but there are some active moments, particularly those featuring the film's wonderfully cheesy soundtrack, that do demonstrate some variance and low end. All of the effects, music, and speech are balanced well within the mix. Like the video, the audio track accurately represents the movie in an unaltered, respectful manner. It's a pretty basic mix, but it gets the job done. The Cutting Edge: Reflections from the Ice (SD, 11 min) - Presented in standard definition with no subtitle options, this is a decent look back at the movie's production featuring interviews with stars D.B. Sweeney and Moira Kelly. The two talk about the audition process, the fact that neither of them actually knew how to skate, the elaborate camera rigs designed for the movie, and the lasting friendship that developed between them while shooting. Though short, fans should appreciate the few bits of trivia offered. Original Theatrical Trailer (HD) - The trailer for the movie is included in 1080p and LPCM stereo sound. 'The Cutting Edge' is a silly, clichéd, but heartfelt little romantic comedy, one that offers some decent entertainment value. Video and audio are both solid and respectfully represent their source material. Supplements are very sparse, but the brief doc does offer some nice trivia for fans. While I doubt many will be rushing out to pick this up, it is worth a look and might make a great rental for you and your loved one, or if you don't have a loved one, then… well, just you. Though I recommend that much, much less.